I love all things Angry Birds. I love the games, the round stuffed animals, and all the cakes posted on the Angry Birds Facebook fan page . Having just made pig cupcakes (even if they were pink instead of green), I decided to try my hand at Angry Birds cupcakes. 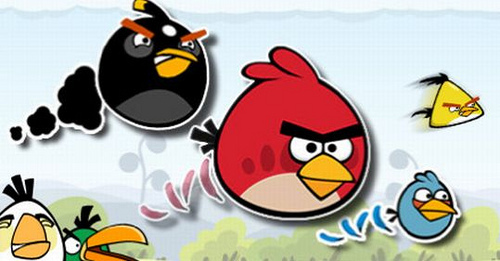 If you don’t know what Angry Birds are, see the picture below…AND GET THE GAME FOR YOUR PHONE!! It’s highly entertaining and addicting. I decided to make my three favorite birds: The black bomb birds, the classic red birds, and the super-fast yellow birds. Not only did I make the cupcakes look like the birds on the outside, but I also flavor-coded them so they matched on the inside. The black birds were chocolate cake with chocolate icing, the red birds were red velvet cake with cream cheese icing, and the yellow birds were lemon cake with lemon icing. I’ll go through each bird separately to show you the recipe and how I made them. These guys were my favorite to make. I added some black coloring to chocolate frosting to make it the correct color. This is much easier than adding black to white frosting. I used an angled cake spatula to add the frosting to the entire cupcake. Then I used a #16 star tip to add some fluffy chest feathers at the bottom. 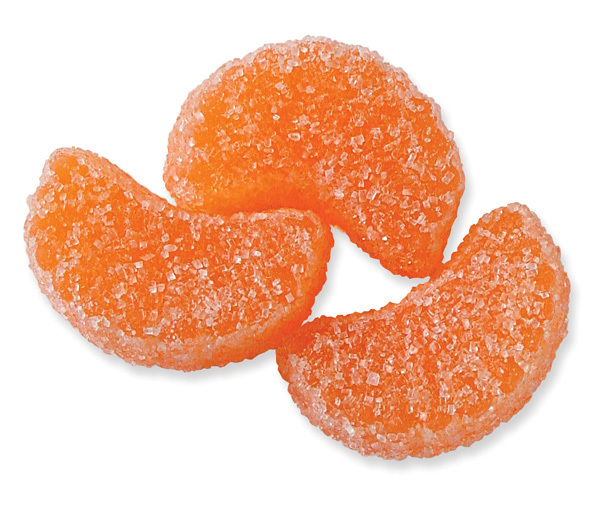 The beak was made out of orange gummy slices. I just cut triangle shapes with a pair of scissors. It was tricky, since the scissors tended to get sticky. The eyes, bags under the eyes, eyebrows, and reflective spot were made from buttercream. I used glitter gel to dot the pupils. Lastly, the fuse was made from a licorice stick and the flame was made from a candy-coated sunflower seed. I glued the seed to the licorice with royal icing. 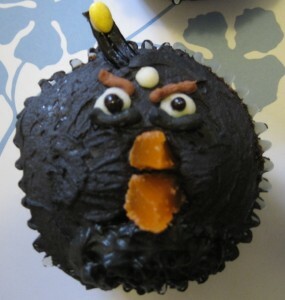 The beak and fuse were placed on the cupcake while the frosting was soft. Once everything was in place, I put them in the fridge for everything to harden up. Preheat oven to 350 degrees. In a medium bowl, stir together the sugar, flour, cocoa, baking soda, baking powder and salt. Add the eggs, milk, oil and vanilla, mix for 3 minutes with an electric mixer. Stir in the boiling water by hand. Bake for 17-20 minutes for cupcakes, or 30-35 minutes if making a cake. Either way, you know it is done when a toothpick inserted in the center comes out clean. Cream together the butter and confectioner's sugar in a mixer until fluffy. Add the cocoa powder, vanilla, and milk. Mix for an additional 3-4 minutes until smooth. If you want your frosting to be thinner and easier to spread, add a little more milk gradually. These guys were made very similarly to the black birds, except I turned their beaks on the side instead of having them stick straight up. Licorice was used for their tail feathers, head feathers, and eyebrows. For these guys, the chest feathers ended up looking like beards. So next time I would just spread it smooth with a knife instead of using the star tip. Preheat oven to 350 degrees. Mix flour, cocoa powder, baking soda and salt in medium bowl. Set aside. In a mixer, cream together the cream cheese and butter until creamy. Mix in the vanilla, then gradually add in the confectioners' sugar. Store in the refrigerator after use. These guys are nearly identical to the red birds, except I used black licorice for their head feathers, and their eyebrows are made from chocolate buttercream. They are normally a triangular shape in the game, but it is difficult to shape cupcakes, so I kept them round. In a separate bowl whisk together the flour, baking powder, salt, and lemon zest. In the bowl of your electric mixer, or with a hand mixer, beat the butter and sugar until light and fluffy. Add the eggs, one at a time, beating well after each addition. Beat in the vanilla extract. Squeeze in the lemon juice. Evenly fill the muffin cups with the batter and bake for about 17 - 20 minutes or just until set and a toothpick inserted into a cupcake comes out clean. Cream room temperature butter with a hand mixer, the paddle attachment of a stand mixer, or a wooden spoon until smooth and fluffy. Gradually beat in confectioners' sugar until fully incorporated. Beat in vanilla extract. Add milk and lemon juice, and beat for an additional 3-4 minutes. 2. 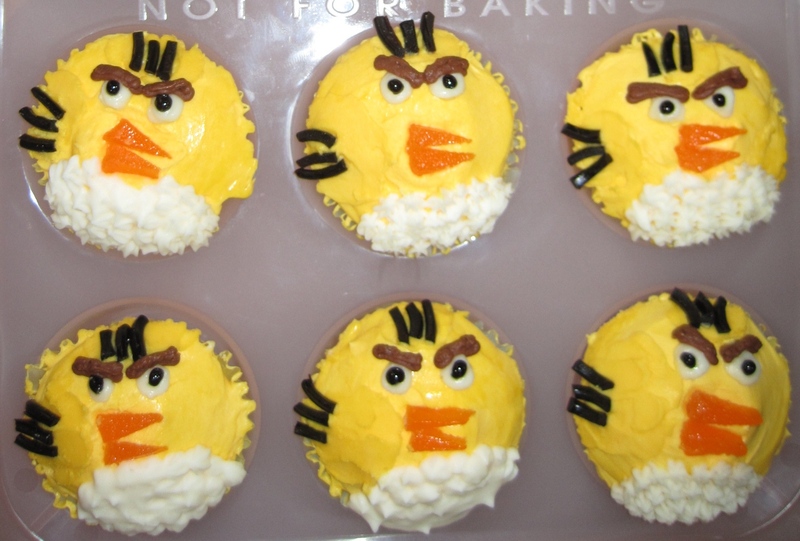 For the red and yellow birds, start the faces fairly low on the cupcake since they have big foreheads. I neglected to do this. 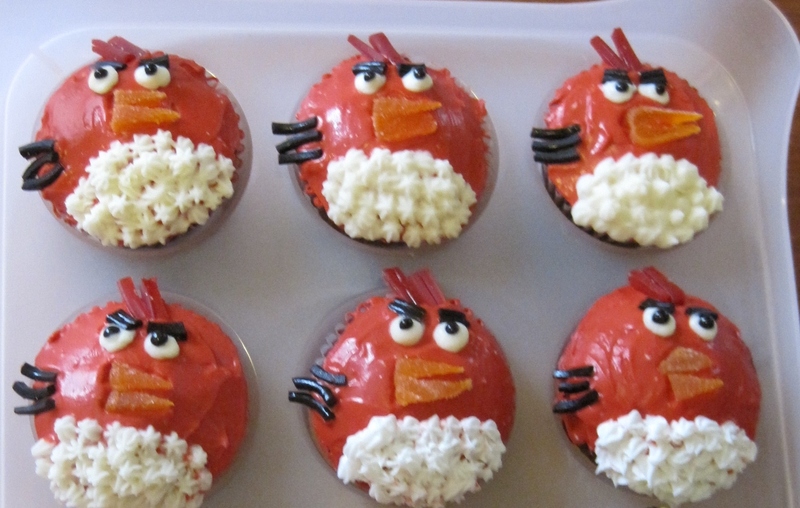 I thought my cupcakes looked like birds that were angry, but not necessary Angry Birds. I think they would have looked a lot more like the characters if they had some forehead space between the head feathers and where the eyebrows started. This entry was posted in Cupcakes, Frostings/Icings. Bookmark the permalink. Love the angry birds. They are so cute.